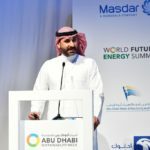 Turki Al Shehri, head of Saudi Arabia’s REPDO (Renewable Energy Project Development Office) announced on January 16th during WFES in Abu Dhabi that new renewable energy projects totalling 4.1 GW will be tendered this year. Among them, 3.3 GW of solar PV and 800 MW of wind. Most likely, these correspond to eight projects and will be put out to tender in two separate rounds.